"I was looking to be stunned and moved. Changing deep-seated beliefs requires of the campaign a herculean effort. A spark that leads to an epiphany that ushers in a new way of thinking. The best of the bunch delivered on that in varying degrees. Due to the nature of the brief, I favored campaigns that didn’t ask too much (or anything) of the public and spoke to them where they already were. Common themes proliferated, such as using social networks to connect with refugees. It makes sense and it’s a good place for a message like this. Some suffered from being too small and failed to demonstrate impact. I awarded those that would have really surprised people and in some cases, established relationships with the refugees. All in all, the majority of work came from an interesting place. Many campaigns needed that extra push to get to solid ground. Because this is a competition, I awarded those that were closer to being fully formed and executable. Thank you and keep at it." "A MILE CLOSER TO HOME"
"THE FRIEND OF YOUR FRIEND'S FRIEND"
"What happens in the darkness?" Agency: FCB Ulka Advertising Pvt. 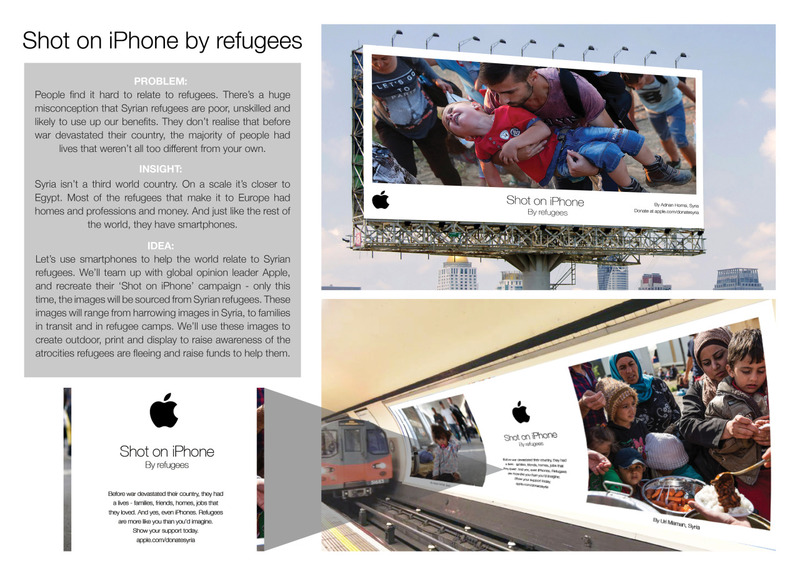 Ltd.
"Game On for Syrian Refugees"
"Shot on iPhone By Refugees"
"Holocaust or Syrian Civil War?"